It is recommended that applicants to all degree programs take the Scholastic Aptitude Test (SAT). The SAT is a test given by collegeboard.com. Acceptance to Union County College programs are not based on SAT scores. Certain SAT scores will exempt students from the placement test and may be required to qualify for selected scholarships at Union County College. It is the student’s responsibility to register for the SAT exam and have the final scores provided to Union County College. Students may visit www.collegeboard.com directly to review registration information (Union County College CEEB Code is 2921). 6. Health Science program applicants must apply within the required program deadline date. The programs include Practical Nursing, Physical Therapist Assistant, Paramedic, JFK Medical Center Muhlenberg Harold B. & Dorothy A. Snyder Schools, and Trinitas School of Nursing (see Admission to Health Science Programs). 7. JFK Medical Center Muhlenberg Harold B. & Dorothy A. Snyder School applicants must apply directly to the JFK Medical Center Muhlenberg Harold B. & Dorothy A.Snyder Schools; all academic processing will be handled through the Schools. 8. The Trinitas School of Nursing application for admission must be submitted directly to the Student Services Center at any of the three campuses. 9. After submission of the Union County College application and before enrolling in courses, placement testing in English and Math are required, unless a student meets the exemption criteria. The results of the test will not affect admission to the College (see Testing and Placement). 10. Applicants with a disability are urged to seek an interview with the Coordinator of Services for Students with Disabilities. The Coordinator is located in the Student Services Center at the Cranford Campus and may be available upon appointment at Plainfield and Elizabeth campuses. 1. Admission to the Health Science programs requires additional criteria for selection and include Practical Nursing, Physical Therapist Assistant, Paramedic, JFK Medical Center Muhlenberg Harold B. & Dorothy A. Snyder Schools, and Trinitas School of Nursing. 2. Health Science programs require a passing score on the admission exam. 3. Students in Health Science programs are required to attend an orientation session. 4. Distinct grading policies exist in the Health Science programs which differ from other College courses and programs. Specific information may be found in course syllabi and/or handouts. 5. Health Science policies may supercede College policies. 6. Clinical agencies require that students complete criminal background checks before entrance into the clinical portion of the Health Science programs. These background checks are completed by an outside vendor and the results will be shared with the school and the clinical agencies. It is the sole discretion of clinical agency personnel to determine if students are able to provide patient care, based upon the results of the criminal background check. Students who are denied clinical placements will be dismissed from the applicable Health Science program. 7. Clinical agencies also require that students have medical clearance. Students will be informed regarding the specifics of the physical examination, laboratory testing and vaccinations that are to be completed by a physician or nurse practitioner. 8. CPR for the Health Care Provider and individual malpractice insurance coverage may be required for clinical patient care experiences. Further information will be provided during program orientations. After admission to the College and before enrolling in classes, students must take the College Placement Test or meet exemption criteria. The College Placement Test covers English and mathematics and is used to determine whether students are prepared for college-level coursework. While the results of the College Placement Test will not affect admission to the College, it may indicate the need for required developmental courses which must be completed before enrolling in certain college-level coursework. Students who place into college-level math, including students exempt from the College Placement Test, should take the Advanced Algebra & Functions (AAF) exam for appropriate placement. This may allow students to progress through their program at a faster rate. A student who has earned a bachelor’s degree from an accredited U.S. college will be exempt from the College Placement Test. High school juniors and seniors may apply for the Bridge Program to earn college credits while still in high school. Permission of their high school advisor and parent/guardian is required. Bridge applicants must have a ‘B’ high school average. Union County College developmental placement testing is required. 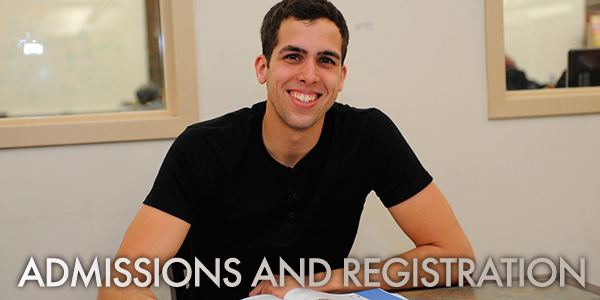 Bridge applicants must test out of all developmental courses to be eligible for registration. Acceptable SAT scores (see Testing and Placement) will also exempt students from the college placement test requirement. Bridge Program applications are available in the high school guidance offices or the Recruitment and Admissions, Records, and Registration Offices on any campus. Students will be required to submit a Union County College application for admission with the completed Bridge form. Acceptance will be based on the results from the placement test or SAT scores and submission of required documents. Students who are in the American Honors Program, Educational Opportunity Fund Program (EOF), Health Programs, JFK Medical Center Muhlenberg Harold B. & Dorothy A. Snyder Schools, Trinitas School of Nursing, and Rutgers SHRP will meet with and do all registrations through the program advisor.